Munnar is about 124 km from Ernakulam, the nearest place to Munnar which is connected to railways. From Ernakulam, we booked a car for Munnar. It was early in the morning and past experience showed that a journey during this time of day is most enjoyable with fresh air everywhere. Same was the case this time. During the initial stretch of 100 km, the road condition was very good but after that it became full of potholes, delaying our journey by around 1 hour. As one would expect, after travelling in the Himalayas, the roads leading to a popular hill station to be less crowded having no human settlements on either side of the road. It proved that this was not the case with NH 49, the road connecting Ernakulam to Munnar. The entire journey was met with thickly populated villages and towns. We saw river banks with trees almost touching the river surface. It can be said that not a single point was seen uncovered with a lush green blanket of vegetation. We stopped at Cheeyappara waterfalls, a small picnic spot. The local crowd was enjoying the seven-step waterfall. We reached Munnar little after noon. Munnar is situated in Kannan Devan Hills of Western Ghats range and is in Idukki district. The name Munnar means 'three rivers', referring to the location of Munnar at the confluence of the Madhurapuzha, Nallathanni and Kundala rivers. After booking a room in Munnar, we talked to the hotel manager who gave a leaflet which had details of places to visit in and around Munnar. Basically, there were four different roads diverging from Munnar which had viewpoints. We decided to cover two on that day and rest of the two roads on the following day. We started with our trip towards Eravikulam National Park and Anamudi Peak. After buying tickets from the counter at the National Park entrance, we went inside by bus. On that narrow road, the speed was more than what a cautious driver should adopt. From the bus, the view of Tea Gardens on hill-slopes was freshening and rejuvenating. This national Park was the first national Park in Kerala set up to provide natural habitat to Nilgiri Tahr. Other species which this Park protected were Sambar Deer, Golden Jackal, Jungle Cat, leopard and tiger along with few lesser known animals. On a clear sunny day, what could be better than climbing up a hill and getting best opportunity to click few nice pictures of gorges, distant peaks and water streams all the way up to where we were allowed to go. It was nice to see sun rays, filtered through the trees, coming on the road. At one place we could feel like partially hidden by trees where sunlight seemed to be coming from a tunnel mouth. While wandering inside the park we could see the steep Anamudi peak, the highest peak in India south of the Vindhyachal range. Standing at 2695 meters, this was, in fact, the highest peak in India outside Himalaya-Karakoram range. In Local language, the name Anamudi means "Elephant's Head" which is attributed to its resemblance to an elephant's head. We could not see any animal during our short travel in the park as is the case in most of the reserved forests -you have to be very lucky to spot any animal during your visit to a wildlife sanctuary. We did find one animal near a water stream very similar in appearance to a sheep, probably Nilgiri Tahr itself, although we could not determine its identity as there was no guide with us. It was already getting dark when we left Eravikulam National Park and after talking with locals about the timings of places on the Ernakulam side, which they said would be closed, we abandoned our plan to go to that side of the town. It was time to walk in the streets of Munnar and buy few local items. 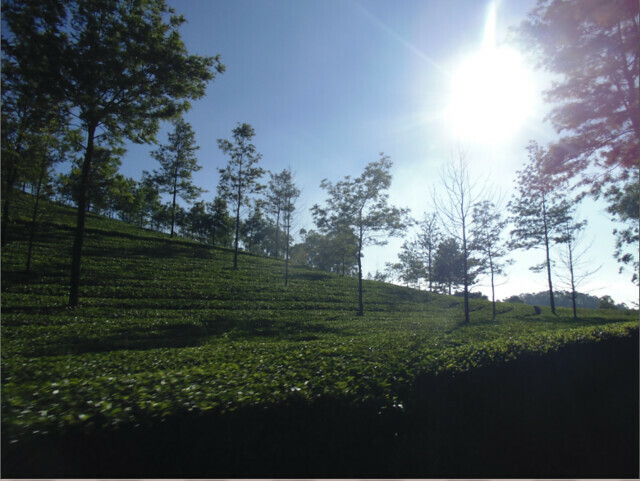 Munnar was known for its tea gardens and other spices like cardamom (elaichi), clove etc. The local market was abundant with a variety of teas, spices and wooden artifacts. Keeping in mind that we would not find so many varieties to choose from at such reasonable prices, we bought some spices. As Christmas was approaching, there were places in town which were decorated. Thus ended our first day in Munnar. We decided to wake up early next morning so that we could cover more places next day, namely Mattupetty and Kundala dams and tea gardens. See photos of Eravikulam National Park, Munnar also. Find pictures of Eravikulam National Park, Munnar on Flickr here.